Welcome back, readers! We have returned from our July break refreshed and ready for a new school year of sharing ideas, resources, and teaching practices here at Two Writing Teachers. For many of us, the first day of school is right around the corner, and we are turning our attention to preparing our lesson plans and classrooms. Here at TWT, we thought it might be helpful to host a blog series – some ideas about how to Sharpen Your Workshop Routines. Each day, one of the TWT team will write about a workshop topic that (we hope!) will be both helpful and well as of interest to you. 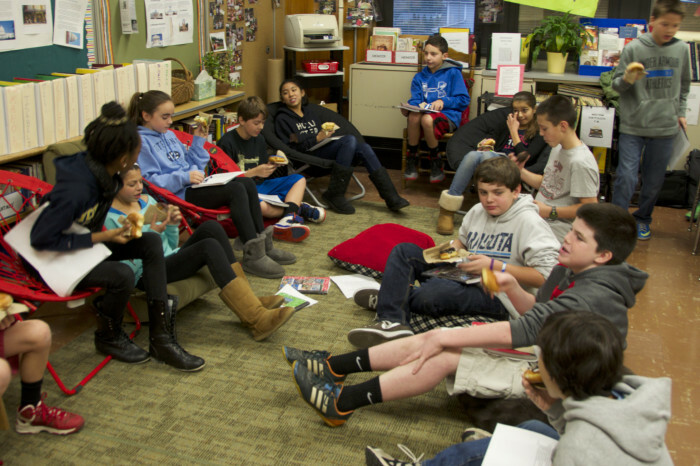 We hope you will join us each day, and share your thoughts and ideas as well. 1. Sharing my own writer’s notebook: A few weeks ago, Penny Kittle Tweeted out this quote by Mem Fox: “If we are so foolish as to dare to teach writing without ever writing ourselves, we are treading with arrogance on shaky ground.” I believe wholeheartedly in this idea – we cannot teach writing if we don’t write. And there is nothing so powerful as making this known to our kids on the very first day of writing workshop, our own writer’s notebooks in hand. If you haven’t kept a writer’s notebook, start NOW! None of your carefully planned mini lessons will count as much as this visible reminder to your kids that you, too, live a writer’s life. I always bring along my current writer’s notebook, and I do so because I want my kids to see that it is a living, breathing writer’s notebook, not a pre made prop I haul in every year for a demonstration. Our kids are smart enough to spot inauthenticity right away, and this detail holds more currency than we might think. Not all my notebook entries and jottings are ones that I wish to share with my kids, so I tag a few with sticky notes and gallery walk through my notebook this way. I want my kids to see the variety of ways in which I write, and the many types of “jump starters” I use to inspire writing. I share incomplete entries and ones for which I have left blank pages – I want them to know that returning to entries to add and extend ideas is a natural part of writing. And I also share messy pages in which I have scribbled here and there, with arrows and marginalia added in different ink at different times when I’ve returned to my notebook to re-read – that’s part of the writing life, too. 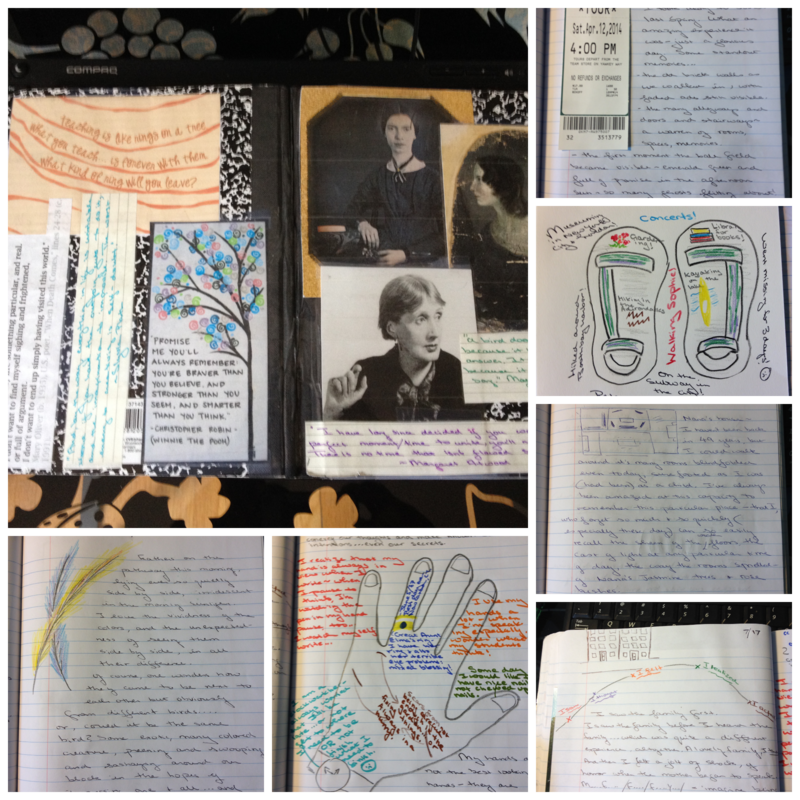 All of this is to remind students that the purpose of the writer’s notebook is just that…to practice and grow the craft of writing. I make a point of checking notebooks quite often in the early weeks of school to make sure that they are not also being used to take notes for music or health class, I also make a point of sharing the way I respect my own notebook as a place for just writing – not making grocery or to-do lists. Planting these writing seeds in these early writer’s notebook pages gives my students plenty of ideas to draw from all year long. Quickwrite, to me, means to write fast for a short amount of time,less than three minutes. It is writing to find writing, not planning or thinking through the writing before the words hit the paper. It is writing for the surprise of not knowing you were going to write what you wrote. But it is having something to see, hear, and hold on to (borrow a line and write from that line) as you try to find ideas for your own writing. I use picture books, poetry, passages from YA books, and ideas directly from 100 Quickwrites for these writing exercises, and I encourage my kids to return and extend these quickwrites all year long. Sometimes, they contain the seed ideas for memoirs , narratives, and other types of genre studies. Whenever a student feels that an entry is private, they fold the page over and label it as such. Whenever a student feels that they have begun an entry that they know for certain they want to return to and extend, they place a sticky note on it. I find that it is meaningful to build intentionality into keeping of a writer’s notebook – I want my kids to feel, right from the beginning, that their writer’s notebook is an essential part of their workshop tool kit. Twitter Chat: We’ll wrap-up our week of blog posts with a Twitter Chat on Monday, August 11th at 8:30 p.m. EDT. This will be an opportunity to talk about procedures that have worked in the past and new ones to start before the school year begins. We will use the hashtag #TWTBlog. ← WRITE. SHARE. GIVE. IT’S SOL TIME. 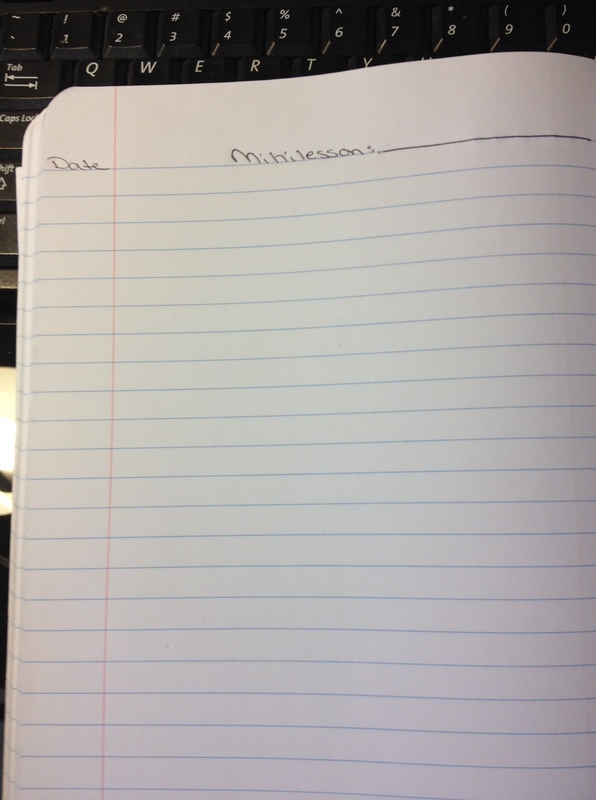 Can you explain what a “copy of your mini-lesson” might look like in a student’s notebook? Does this mean they are writing down your teaching point? Are you copying your chart for them to glue into the notebook? Thanks! I want to come and visit your class this year, Tara! 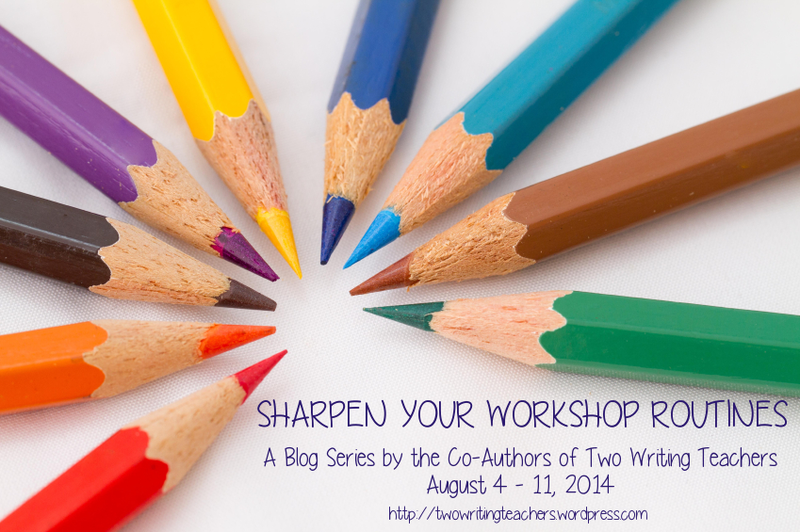 I long to see your students at work in writing workshop. Bonnie says you’re a phenomenal teacher (which I already knew from talking with you in person!) and this post is yet another reminder of how much thought you put into the workings of your classroom/writing workshop. I LOVE that you bring your notebook to the rug for sharing and show students your in-process notebook (NOT AN OLD ONE!) at the beginning of the year. These things are so important. While this post contains lots of wonderful tips for setting up a writer’s notebook so kids can get writing from the start of the year, I know those two tips will make or break teachers as they lead writing workshops this year. Thanks for an informative and helpful post. Love the ideas with folded over paper for privacy and post-its for un-finished entries. Jan Burkins & Kim Yaris shared a post yesterday that I thought links to your post as it is also about the writer’s notebook and how to start it. They suggest to use a metaphor and the phrase “Small Things Worth Keeping” to explain what might be written about in the WNB/the purpose of it. Glad to see your thoughts Tara. I really like the keeping of teaching in the notebook. How wonderful students are thinking to use their smart phones to take pictures of charts. So SMART! I’ve decided to combine my readers/writers notebooks this year. I’m hoping the reading life feeds the writing life. I’m imagining them working through several notebooks during the year and archiving them in the classroom. We’ll see. Thanks, Carol! I love that quote, too – I’m sharing it again and again in the hopes that more teachers of writing will come on board. What a great post with so many ideas to come back to. 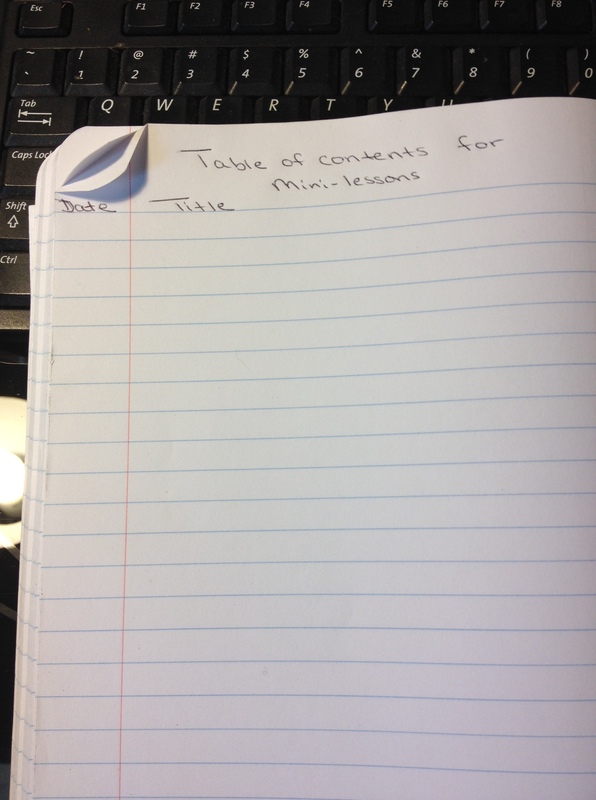 Appreciate knowing that a minimum two notebooks were needed and the visual of the “Table of Contents for Mini-Lessons” was helpful. If notes or practice don’t go in the WNB, hard to remember the lesson even with anchor charts. Thanks for the strong start to August! Thanks, Fran. I sometimes wonder if it’s necessary for my kids to have copies of our mini lessons…and then it turns out it was needed! Many of my students also use their smartphones and create an album of mini lesson charts. Why not use tech when we can, right?! I think the key is “Many of my students also use their . . .” because when they want to hold on to the charts, it is their choice to create that album! Love that they have the opportunity which means they will be “used” not just “admired” as subtle differences are also critical! I am so glad that you found us! Don’t hesitate to ask questions- we are all in this together. PS. My epiphany came with Atwell, too! This will be my only post for August, Bonnie. But I’ll be back after eye surgery – typo free! Thank you for this post! I am so excited to be back in the classroom teaching ELA/SS to 6th and 7th graders! This has given me lots of things to think about. You will find Linda Rief’s new book, Read, Write, Teach to be especially helpful for your 7th. 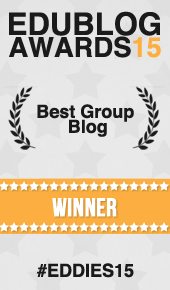 Graders – check it out! Thanks for the recommendation. I will look this book up right away. Great post, from Day One I always wanted students to know that we’d be writing and celebrating that work often. Love the quote from Fletcher at the end-don’t know that one-will share it. Thanks, Tara. I think we accomplish so much in that sharing/celebrating time, don’t we? My kids have always spoken about how they loved that aspect of writing workshop. I am going to use a binder with my grade 2s instead of a notebook. I find the flexibility of a binder is less intimidating for little people. 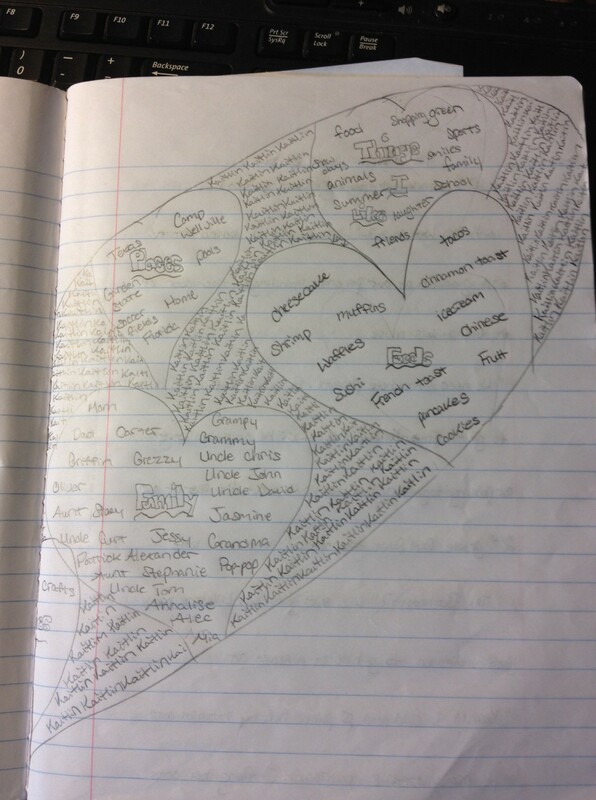 I need to get busy making my new mind map, heart map, etc. Question: My students will be brand new to WW. What sorts of things should I do to set us up for successful sharing sessions? I keep thinking if grade 2s as such little people, and j want to get the routines right. They are independent than grade 3s! Sorry for my mistakes…I’m typing on the phone with a toddler on my lap! Thanks for stopping by, Lisa! I set a timeframe for sharing, about 5 to 8 minutes. I make note who has share d so that the same people are not always the ones to share their thinking. But I think that any grade level needs the time limit- we share so we can learn, not so that everyone can just talk. There has to be a sense of serious purpose. Thanks for all the terrific information, Tara. I do exactly what Aimee Buckner does– once the kids have found ideas in their WRNotebooks that they want to develop into longer, fuller pieces, they go to paper outside the notebook, or directly to the computer. Often an idea will begin to grow in the WRN, as the writer goes back to it again and again. When it feels ready to develop into a finished piece, the writer carries it out of the WRN. I’ve been working on ideas for a children’s book about a bison calf my son and grandson rescued from the field and the ideas pop into the notebook months apart. It’s getting closer. Once we get into the habit of writing, it becomes exactly the lovely breathing in and breathing out that Fletcher writes about. Funny story about notebooks- I am on holiday in England now, and I took my notebook along to pause and write on a long hike along the Cotswold Way. A goat wandered over from a pasture and made immediately for my notebook. I had to trade him my sandwich in order to get it back! And yes, this story made its way into my notebook, too! PS. Hooray for your children’s book- looking forward to it! So happy you are back! This series is going to be a great one and I’m looking forward to the Twitter chat. Jack Gantos talked about drawing a map of a known place (house, neighborhood) and how it leads to seed ideas during his keynote in June at TCRWP. I’m excited to wrap my head around how we are using notebooks in our workshops at our school… but I’m also really excited about/ working on keeping and regularly using my own notebook. That has been more challenging for me than blog writing. I often think of things I want to write in a notebook but don’t have it with me. So I’m making it a habit to keep it close and I made one simple change that has made that easier to do. I bought a smaller notebook. I too loved Penny Kittle’s tweet quoting Mem Fox. Thanks for this post! Yes, it’s that habit of writing something every day. I just paste my scraps of paper in later, should I not have my notebook on hand. It’s messy but gives my notebook a lived in feeling. Love this! What if kids want to go back to a story and write more-but their story was at the beginning if the notebook andvt here have been 10 other quick write/free writes since then? Do you have them glue in paper-make a note (story in pages 2-3, note: continues on page 22)? 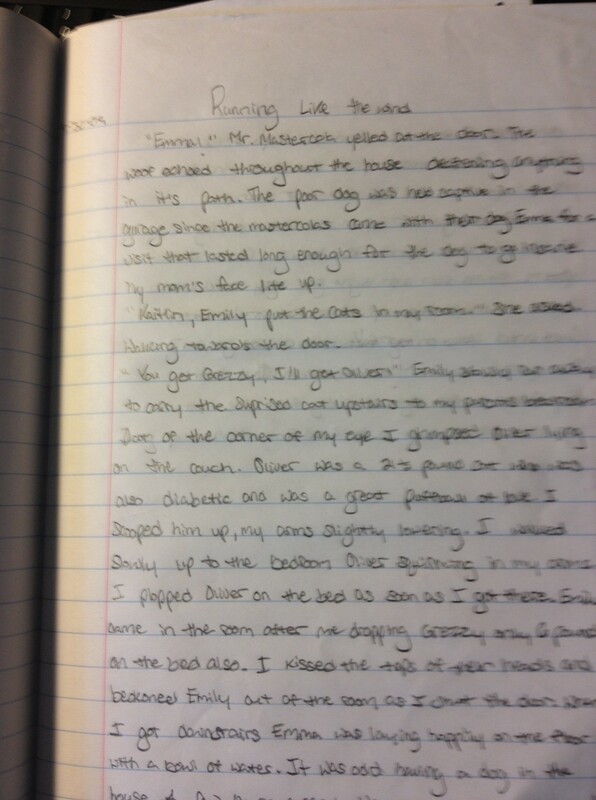 I am reading Aimee Buckner’s Notebook Know How and she has the students move to yellow legal pads to draft longer pieces. I know I’ve read that Tara does this, too. I plan to try it this year. The notebook remains a place for getting ideas on paper, but drafting happens somewhere else. I’ve used the yellow paper idea too. I love the way it signals moving on to the next stage. I also found that it was a good organization strategy for some of the disorganized kids. We date our work and use sticky notes for cross referencing, Noel. Dating entries really helps, and since my kids often go back to rethink this or that entry and extend their ideas more. If they feel that they want to develop an entry into a longer piece, we go out of the notebook and into their yellow legal writing pads. There again, the date helps so they can revisit the original entry if they want to.